Forensic science in crime novels: Val McDermid on mystery ideas. 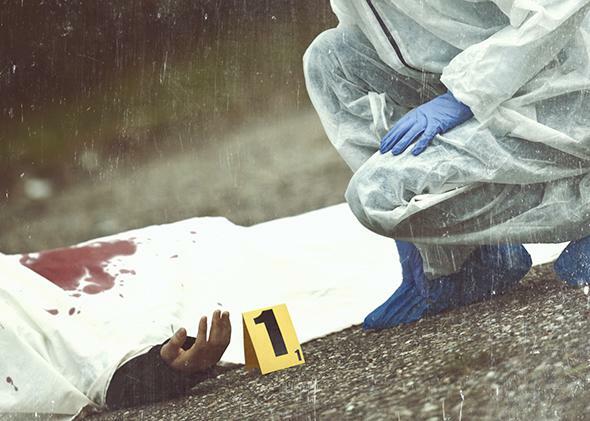 How forensic science makes mysteries more believable. Real-life crimes don’t get solved the same way they do in crime fiction. Val McDermid is a Scottish crime writer who has penned more than 30 novels. To coincide with a new Wellcome Trust exhibition, she has written a nonfiction book on the history of forensic science, Forensics: The Anatomy of a Crime. Telling the truth about science can help create the suspension of disbelief that is vital to good fiction, she says. How has forensic science influenced your writing up until now? It helps me to anchor my books in the real world. Everybody knows crimes don’t get solved the way we write about them in crime fiction; it’s not one grumpy inspector and a sergeant buying the pints. But anything I can do to bolster your suspension of disbelief is valuable. If I tell you the truth about the science, it helps make you think I must be telling the truth about all the stuff I’m making up. It’s things that make me go “wow.” For instance, I once rang up the forensic anthropologist Sue Black at the University of Dundee because I wanted to know what your tattoos would look like if you’d been submerged in a bog for 200 years. She said that when you get a tattoo, the nearest lymph nodes take up the ink. It occurred to me that if the tattoo was made after death, there wouldn’t be any staining on the lymph nodes: I had a starting point for a novella. I snap up trifles like that. It’s the same thing that makes me good at pub quizzes. How much scientific research do you do for your novels? It depends on the book. I might just ring up a forensics specialist and say: “I want this piece of evidence to lead to this; how do I do it?” Very often the stuff that really works comes in at tangents—the conversation leads to something much more interesting. In general, the scientists are just delighted that anyone is interested in their work. Were you surprised by anything you learned while researching your new nonfiction book? Over the years I’ve spent a lot of time with people who do this for real, so I have a pretty good idea of how completely unlike CSI or Silent Witness it is. But the truth is often stranger than fiction. For instance, I interviewed a researcher who investigates the synthesis of illegal drugs. She told me that at any given time, she’s got a cupboard full of crystal meth. At one point she had her Ph.D. students going out to buy decongestants for the raw ingredients to make it. Crime novelists and screenwriters have been blamed for giving jurors unrealistic ideas of forensic evidence. Is that a fair criticism? I think it happens, though it surprises me that people are that naive. I suppose that when evidence is presented week after week with an aura of scientific certainty, it does have an effect. You could argue that we should take more responsibility, but it is entertainment. By and large, I try to be pretty accurate in how I write about the science. But sometimes you do need to make changes for dramatic necessity—for instance, squeezing a test that would take three weeks into two days. That’s the area where we mostly fall down—compressing time frames. Will your new book change people’s views? I hope readers take away a greater understanding of the science, as well as an appreciation of the integrity and commitment of the kind of people who do this work. What they do is just as important to the living as it is to the dead.